Baked Pork Ribs is another very easy and delicious recipe. 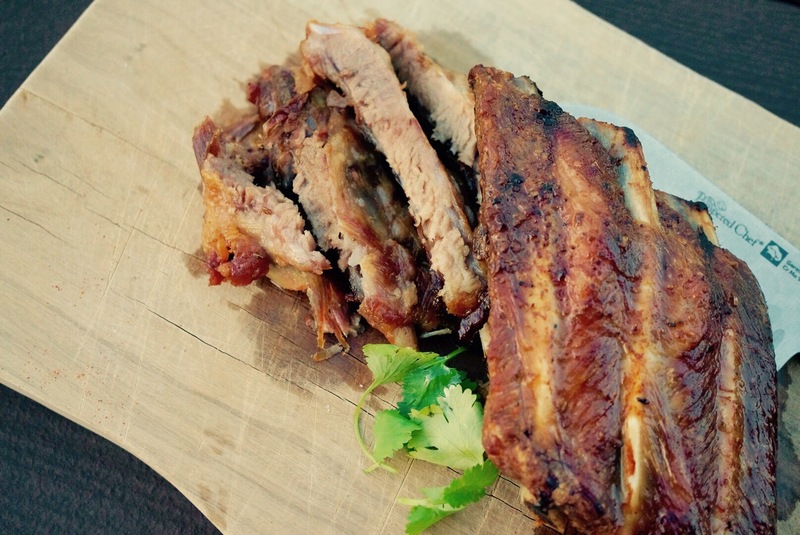 We get our ribs from the amazing Clover Hill Farm in Linneus, Missouri. We were so luck to find a farm that goes the extra mile to care for their animals and deliver the best product. As a bonus, our farmers have been through the GAPS diet which enables them to really understand our needs. We feel so blessed to have this wonderful source of clean meat, from animals that were raised with good nutrition, lots of sunshine and love. The perfect source of nutrition for our delicate bellies! This recipe actually came from Paleo Cupboard. Dinner time was approaching, we were hungry, and our family can't tolerate cayenne pepper quite yet. I also didn't slow cook, but even with these changes, the ribs were still juicy. Our bellies were happy, full and the ribs were ready in 45 minutes! Line a rosting pan with parchment paper and place a rack inside. Mix all the spices in a small bowl and rub on the top and bottom of the ribs. Place ribs on rosting pan rack and place it in the oven. Bake them for 45 minutes turning them over at the half-way point. Serve with your favorite side dish!